Donut Plains 4 is the last level of the Donut Plains in Super Mario World, just before #2 Morton's Castle. Since this stage is out in the open, it is a suitable place for the Koopa Troop's aerial force to attack. Therefore, Mario or Luigi meets the airborne counterpart of the Hammer Brother, known as the Amazing Flyin' Hammer Brother, as well as Para-Goombas and Flying Goombas for the first time. The level has a grassland theme. This level consists of one long screen, which the player has 300 seconds on the Timer to complete. There are two secret areas in this level; both can be reached using blue Warp Pipes. To get to the first secret area, the player must enter the blue pipe located near the beginning of the stage, avoiding the Jumping Piranha Plant. 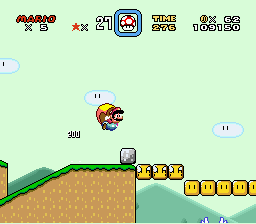 It leads him to a small area with two Winged Koopa Troopas; the player must then jump on green pipes to cross the pit and reach another pipe to exit the area. The second secret area is located farther in the level. Once again, the player must enter a blue pipe to reach a tiny underground area. In the small cave, the player can collect coins as well as a Dragon Coin. The Giant Gate at the end of Donut Plains 4 can be found beyond a large pit. The only way to reach it is to knock down the nearby Amazing Flyin' Hammer Brother, then jump onto his flying platform. The player can also fly over there by using a Blue Shell or simply a Cape.